So it's time for some first impressions of the full game. Hopefully this can lend some insight into whether or not you'd like to get the game, or how close it is to the other Phantasy games you remembered playing. Plus, hey, it's free! So if you don't like it, you're not out anything but download time. 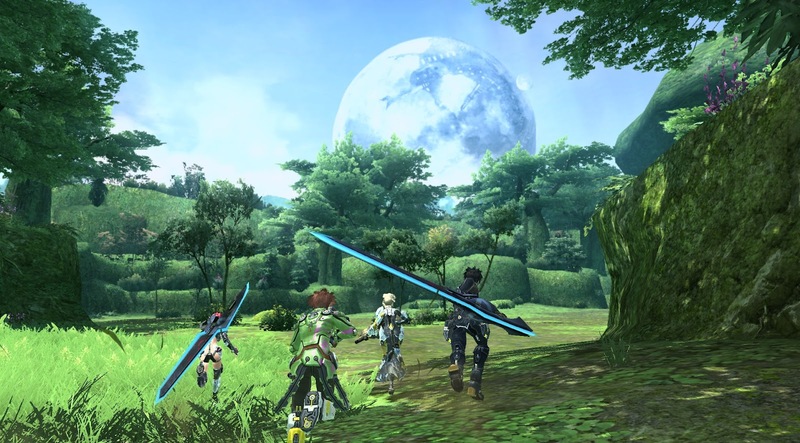 Post assumes you are familiar with Phantasy Star / Phantasy Star Universe. It's all in Japanese still, but groups are working on an English patch. Interestingly, the head developer. of the game commented in an interview on how he was amazed by how fast people patched their beta client & the chararacter create demo for English menus So...whoever this is seems top notch on speed & getting it to work. You can muddle along without understanding it (I am) and without requiring tons of guides. If you want to just 'bash monsters & be cool' that's certainly do-able. Is there an english-language community? Yes. Holed up on Ship 2 Block 20,21,22 with 20 being the main. It's this way because PSO-World dedicated it early on for their community. You Can't Change Ships! That's important, because if you charcreate on the wrong ship you will have to either delete it, or pay 5 bucks to make a new on on the ship you want. There ought to be paid move tickets later but that's way later...so that's rule 1 for now. It's well established, and makes it much more fun. It's also important because working together in multi party areas (where your team merges with others!) can create awesome bonuses & help everyone level fast & grab cool stuff. Because the worldwide release isn't for like...6 to 9 to 12 months. Why localizing it is going to take that outrageously long is unknown. What that means is also unknown. Anyone on world wide PSU knows the kind of trash treatment the planet got from that paid game. Are they going to stumble again? Take money and give nothing? Promise content to keep the dollars rolling in, but then never give it out but keep the money like what happened with PSU? No one knows, and there's no way to tell till it's out. There will also likely be a way to patch your japanese server guy over onto the english/european/whatever side. That's one advantage of PC gaming --you can better mess with the data. How's the free/pay content so far? Usually a game will release "on topic" stuff before releasing silly clownish items to mess around with. That's to build up the look of the game, let people look awesome, and get a good library of selection going for weapons & clothing so people are more likely to get the look they want & stick with the character. Huge ruffle bridal gown, wedding tux suit, wacky rappy masks, summer yukata male/female, & bikinis for the ladies. You'd think they'd want to throw everyone a bone and toss out the old PSO outfits to grab nostalgia lovers right away but...it seems not so far. PSU also suffered from the whole "Nothing matches, everyone picks to look goofy, it's covered in clowns, cosplayers and bikini people wielding squeaky mallets." Lots of the previous fans said the game lost its entire style because it didn't keep the balance. Don't take it the wrong way though, as customization is still better than probably 99% of the games out there. More outfits, more options, more stuff IS on the way. It's just not here yet and there's likely still enough to keep anyone satisfied while waiting.